Wow, times really fly. I still remember my first visit to Todai in October 2011. I remember three things clearly from that day, Fried Ginseng, lots of creative sushi and unique plastic face mask wore by the kitchen staff there. The review are still up in HungryGoWhere website, click here!! When I got the invitation for food tasting for their 4th Birthday menu, I did not hesitate to say yes.. For a restaurant to last 4 years, they must have done something right. 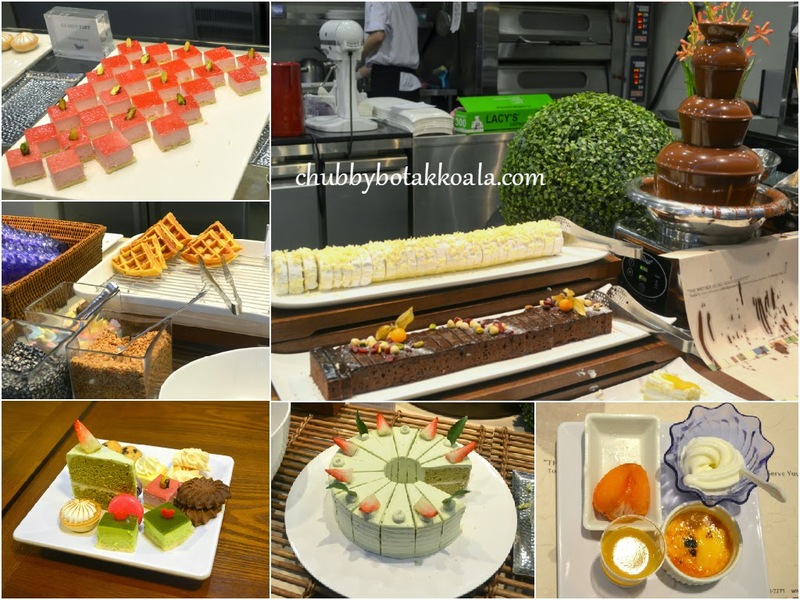 In line with the theme of their 4th Birthday, Todai brings you birthday dishes from around the world to complement their buffet line up. From China, we have Longevity Noodle (Yi Mien) and Longevity Peach (Shou Tao). The noodle is very springy and flavourful. The broth used to cook the noodle are robust. Meanwhile the Shou Tao is soft and packed with red bean paste. Korean Birthday dishes are represented by Japchae, a sweet potato noodles, stir-fried in sesame oil, vegetables and meat; and Miyeokguk (wakame seaweed soup traditionally consumed by women after giving birth due to iodine and calcium content). Japchae is thick, springy and slightly chewy. It has a robust sesame oil flavour and bind the ingredients well together. Don't let the clear looking broth of Miyeokguk fools you. It is robust and filled with the essence of beef. Drawing inspirations from Ghana and Nigeria, Todai's Chef produced Oto (hard boiled eggs, yam and palm oil) and Jollof Rice (rice with coconut oil, fresh red chilli pepper and aromatic spices). Todai's Oto uses potatoes instead of Yam and incorporates seasoning close to the original Ghana version. For me it tasted like thick mashed potatoes with hard boil eggs, however the seasoning does not bode well with my taste buds. Jollof Rice suppose to be a close comparison to briyani rice in Singapore food culture. However, with the seafood and fresh cut chilli, it looks more like a Seafood paella. The prawns are fresh, the rice is flavourful, and tasted closed to nasi briyani. Watch out though, this dish pack heat. Finally, a birthday dish will not be complete without a birthday cake. From Russia, 4 layer birthday cake. Russian version of rainbow cake, but with thicker cream in between. The cake is tasty, moist, but the cream can be a little too rich for some. While the birthday dishes are unique, expect the staple dishes that you will normally find on Todai. Part of the cold dish consist of Sashimi, Alaskan King Crab, Oysters, Mussels and Prawns. These ingredients are fresh. You can mixed your salads in the huge parmesan cheese bowl for added flavour, or proceed to the fantastic sushi selections. I always find their sushi rolls are creative and impressive. To name a few, crunch, spicy salmon, volcano & lion king. 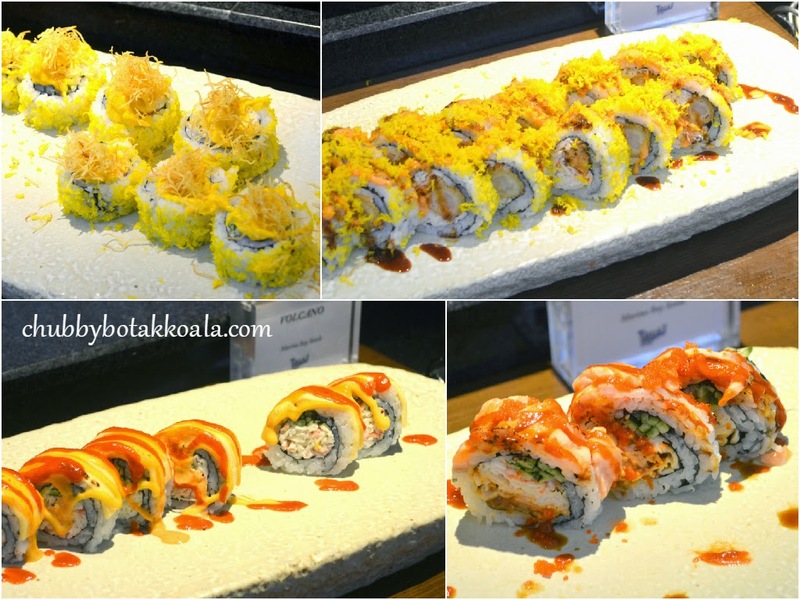 But when you are having buffet, you want to stay away the sushi until you sample the rest of the dishes. Part of the cooked dishes that impressed me today is the Tepanyaki stir-fried beef. The beef cubes are just tender and succulent. Cooked to medium rare with the middle part still pink. From the Churrasco section, I tried their sausages and beef steak. 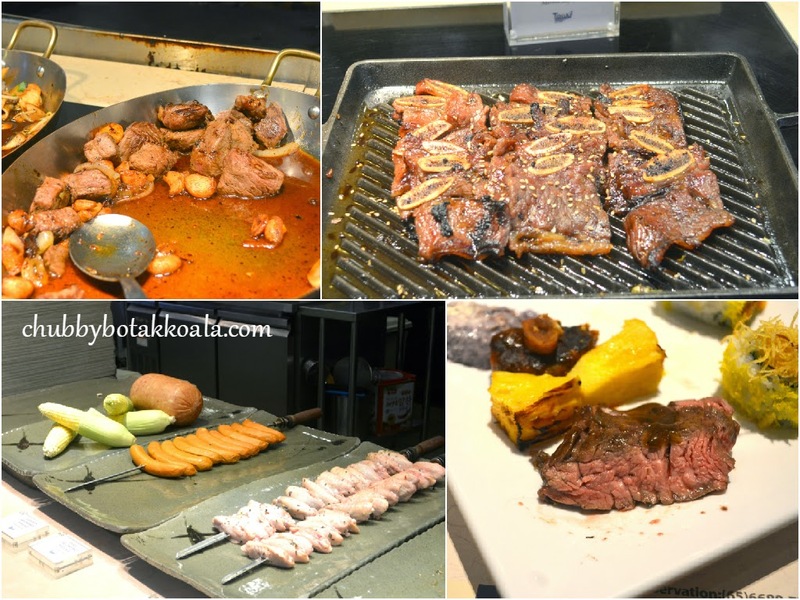 The sausages was average, while the beef steak are tender, juicy and a definite must try. One of the unique dish that I tried for the night is Saus-Vide Chicken with Blueberry Sauce. A rich yet weird combination. While the saus-vide chicken was succulent and tender, the unique blueberry sauce just left me speechless. I can't decide if its genius or nuts. So give it a try and give me your opinion. Well, it seems that the selections of food are just too much for me to try all in one seating. I skipped the Italian, Korean and even the Chilli Crayfish with fried bun. So I decided to end the meal with some desserts. Mango Pudding, crème Brulee, frozen persimmon and soft ice cream are my pick. Not the best, but it provide me with the well-balance ending to the meal. Comparing to my experience three years ago, it seems that the menu revamp in 2014 works quite well for Todai. A better ingredients are used and better execution. I left the place with more positive impression compare to the last. I'll definitely come back for more in the near future. Cheers!! Thanks to HungryGoWhere and Management of Todai for the food tasting invitation.